Terrace Scene tapestry shows a classic scene of statues, urns and distant mountains. Here we see birds on the terrace with fruit, flowers and an urn, with a white drape, and statues in the plaza, and gorgeous blue water of the lake and distant mountains. This idyllic scene invites us into the world of the Mediterranean terrace scene. 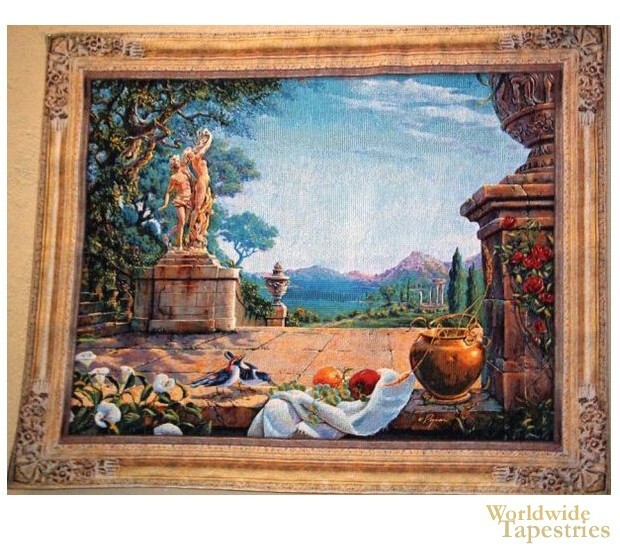 "Terrace Scene" tapestry is backed with a lining and has a tunnel for easy hanging. Dimensions: W 47" x H 38"